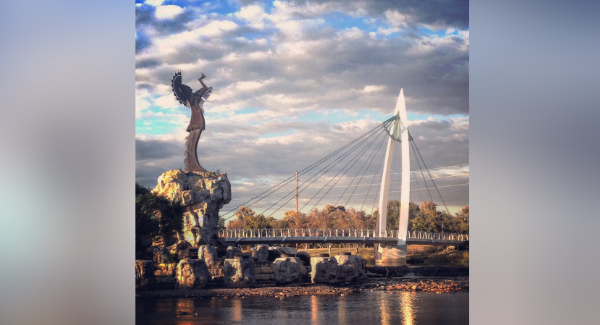 Newman University Master of Social Work (MSW) students volunteered to make a difference in the homeless community of Wichita last month. 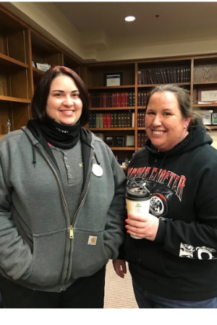 The Wichita-Sedgwick County Continuum of Care (WSC-CoC) conducted the Point-In-Time (PIT) Homeless Count on Jan. 31, and MSW students were eager to get involved and gain experience advocating for those in need. MSW students Rachel Mudloff and Felicia Lama pose before their shift starts. Three students placed at the Veterans Administration for their practicum had volunteered to help so Jones connected with United Way Director of Community Impact Luella Sanders, Ph.D., to gain more information to recruit more student participants. In total, Jones recruited five students to participate in the event with her. The volunteers took part in a one-hour orientation prior to working either a morning or afternoon four-hour shift. Participants worked in small teams with an experienced homeless outreach provider and/or PIT street surveyors and were designated to an area where they spoke with persons experiencing homelessness and assisted them in completing a survey. It was important that the volunteer count stayed fairly low to keep a good ratio of volunteers to those who were experienced. Jones felt that this volunteer opportunity had strong ties to the social work program for many reasons. Social workers will be advocating for and providing social justice for this population and others in need as part of their professional work, so it was helpful for students to take part in the initiative. “Any opportunity I can provide for the students to get some grassroots experience … the more knowledgeable and resourceful they will be once they become social workers,” said Jones. There are also many benefits for the MSW students that were involved, said Jones. Gaining firsthand experience with this population will help the students widen their knowledge base and resume. Taking part in an initiative such as this allowed them to become more aware of the problems this population faces as well as the services available to them.